Over the years, Lifehack has used two main wellbeing evidence bases: The Five Ways to Wellbeing, an abbreviated version developed by the New Economics Foundation which was based upon the work of positive psychology professor Dr Martin Seligman. The second, Te Whare Tapa Whā, developed by Sir Mason Durie, a New Zealand indigenous model for wellbeing. The Whare Tapa Whā was developed as a response to a piece of research by the Māori Women’s Welfare League in the late 70s. Rapuora, the piece of research which had uncovered health issues and barriers amongst Māori, including a lack of spiritual recognition and issues of structural racism. 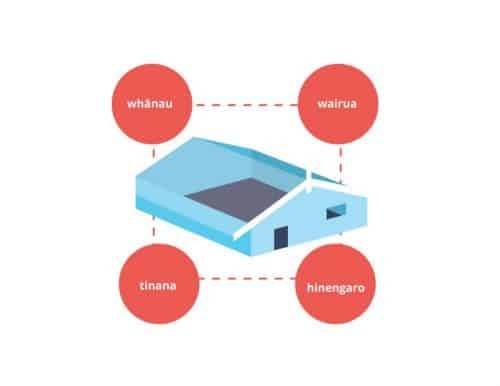 Te Whare Tapa Whā was, and still is, used as a framework that can help support engagement with Māori when it comes to acknowledging the wider contributing factors when it comes to wellbeing. Taha Whānau – The capacity to belong, to care and to share where individuals are part of wider social systems. Te Whare Tapa Wha is a framework that enables conversations beyond the social determinants for health widely acknowledged in the some Western societies: physical and mental health. For cultures that are more community-minded and collectively oriented (such as Māori and Pasifika, and those of Korea and Japan, amongst others) this incorporates the other areas of life that need be well for life overall to be in balance: Family (whānau), spiritual and emotional health. In the Lifehack context, we’ve relied on Te Whare Tapa Whā as the underlying framework for thinking about the wellbeing in the widest sense. Once explained, it’s an easy-to-grasp and practical concept for people of all ages (we’ve tried it with people between 14 and 70). We have noticed that it might take some practice and thinking to work out the spiritual side to those less familiar or at ease with it. Most people find a way to make it work for them: spending time in the sea, running in the mountains, a particular peaceful place in their mind, a church, a community of belonging etc. 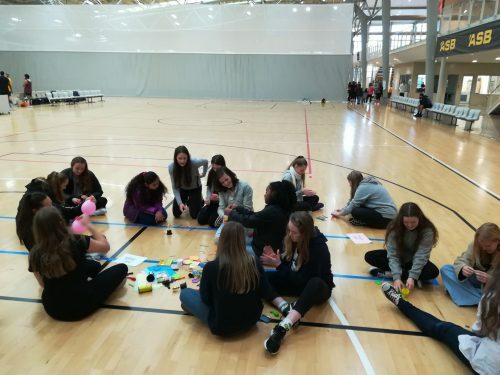 Most recently, we spent the morning at Shift’s EmpowHER conference, which brought together 100 young wahine interested in holistic wellbeing, design thinking and leadership. The workshop facilitator named a series of activities and participants placed themselves on the wall of the whare where they most associated with that particular activity. Examples included: : walking to school, swimming, reading a book, spending time with friends and using Snapchat. It quickly became apparent that the activities crossed over into multiple areas—swimming could be physical exercise as well as a spiritual time. Spending time with friends could relate to whānau as well as emotional wellbeing (and depending what you do together also physical). Once we’d familiarised ourselves with Te Whare Tapa Whā, participants teamed up to prototype how to integrate a multi-faceted wellbeing aspect into their lives. In pairs, they came up with a low-fi prototype made up of pipe cleaners, Play-Doh and paper. They then had the chance to get feedback on their work by another couple before swapping to give feedback on the other pair’s work. They could then integrate the feedback and finally present their works back to the group. For example, one team came up with waterproof headphones so they could listen to their audiobooks whilst swimming (with a view to increase their emotional health through reading, whilst swimming). Feedback from the sessions was that participants gained a greater awareness for needing to balance the different walls in their own life, so perhaps needing to focus more on emotional health, others more on whānau. If you are interested, you can find Te Whare Tapa Wha resources here. Check out Shift for more information about the EmpowerHER conference.